This is the continuation of @AlphaAsh's great mod, which provides the foundation to add new static objects to the worlds of KSP. This statics can also provide various functions like fuel tanks or office buildings, which provide an steady income or new Launchsites and Runways. 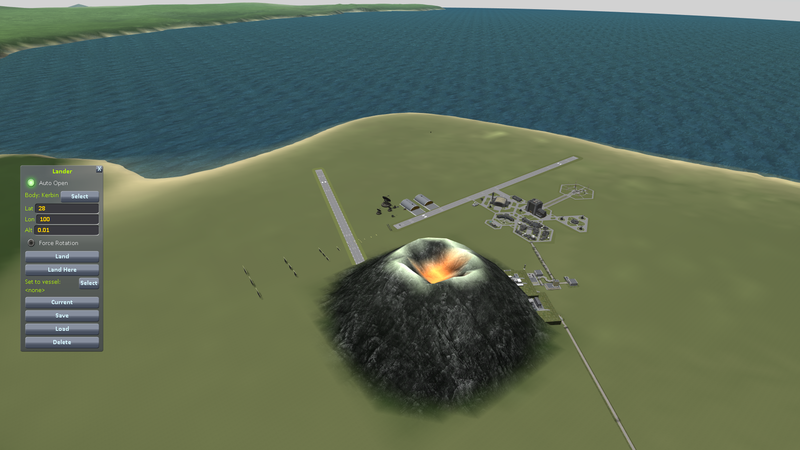 Kerbal Konstructs provides the editor to create new bases and the tools to select new launchsites. It also provides a landing guide. Since Release 1.3 you can also edit the planets terrain, to create mountains, or flat areas where you want to place your bases. Please file a Github issue here. @SpannerMonkey(smce) and @Divico for testing the 1.2 prereleases and bugreports. * BugFix: less crashes on missing .mu ending of 3d model definitions. * use lat and lng for GroupCenters instead of a reference vector. this should fix some issues with rescaling. * added a button in the editor that exports all bases (sorted by group) as .tar files into the KerbalKonstructs\ExportedInstances folder (use winrar or 7-zip) this makes sharing of your own creations a lot easier. * The LaunchSites in the KSP LaunchSite selector are now sorted: 1. KSC 2. Alphabetical order of all KK Launch sites 3. M.H. Launch sites. (the second part is now what is getting sorted. the overall order is nothing I can change. * Renaming a launch site in the KK-editor will no longer produce exceptions in other parts of the mod and will propagate properly into the game. * fixed an exception when a launchsite is no longer existing withing a saved game. * Remove orphaned RemoteTech GroundStations when RT support is enabled. This was only be a problem, when you edit GroundStation within a savegame. * added 7 Builtin GroupCenters, that are hard linked to POI in Kerbin. 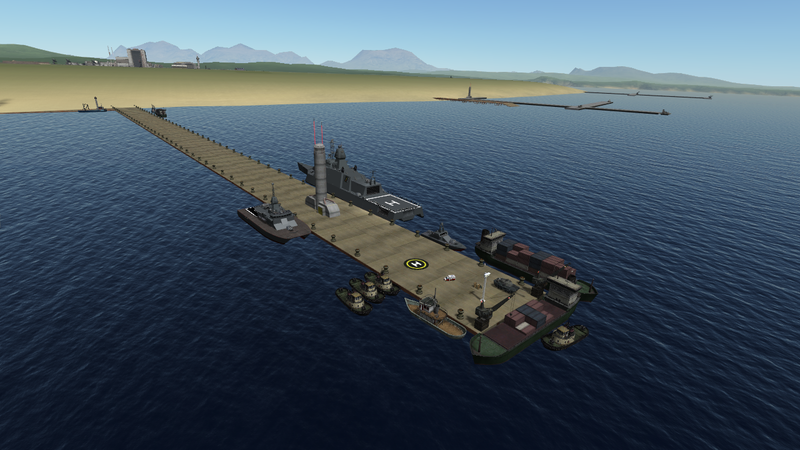 KSC, KSC2, Island Airfield, Pyramids, Desert LS, Woomerang LS. * Fixed the GrassColor editor. * Fix breakage of KK when the cfg files had a mismatch. * career games: display the right recovery percentege on the screen. * enforcement of vessel size, part count and weight for custom launchsites. * some suprprise that is fitting for the end of the year. * you can define variants of your buildings and they are switchable in the editor. * dynamic spawning of buildings, when you are near the physical loading range. this will save memory, for unused bases. * Despawn of buildings, when you are out of range. * the spacecenter camera can focus on bases that are not on the Homeworld. * tried to implement some material sharing, so statics can be drawn in batches. * the KK launchsite-selector in the editor shows launchsite type. * better support for Sigma Dimensions. As soon statics are loaded with the new config format, everything will stay in place. * the Mapview of the recovery bases now caches its contents, which is now slightly more resource friendly. * Added a trigger-CallBack StaticModule, where mods can register CallBack functions when a part enters the trigger collider. * Changed the Water-Floating StaticModule to use the CallBack StaticModule, so I have less duplicate code. * Put the sound cube collider into a different layer, so it doesn't interfere with KSP 1.4.X anymore. * New Feature: a "reduced feature set" statics editor, which can be called through a API call. * BugFix: AdracedTexture: Material replacement now works correctly on multiple transforms. * the launchsite selector no longer crashes if you deleted the config of the last used launchsite. * BugFix: KCT is annoying: repairing it made some bugs visible in the code. * Most facilities will bring you to the correspondig SC facility scenses when clicked from the SpaceCenter overview. * LaunchSites are now fully usable after placing them. No need to restart KSP to test them. * reworked the AutoKourse Static Module. The digit meshes are freely configuable and you can adjust the heading offset. * the AdvancedTexture caches the builtin textures for faster loading. * AdvancedTexture Module: Addes a BuiltinIndex = <int>, so you can refer to diffrent textures with the same name. + BugFix: no more errors in the logfile, when placing Squads buildings. * BugFix: Restore the API for Kerbal Contriction Time. * Added a new Merchant facility type. You can trade all defined resources here. 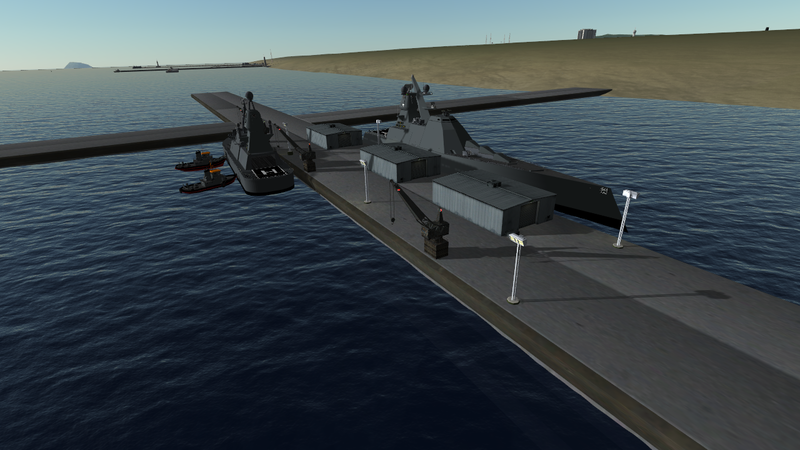 * Reworked Vessel Recovery: All Open LaunchSites have the same recovery range and factor as the KSC. If you are closer than 2500m to a base you get 100% refund. As balancing all LaunchSiterefunds have been removed, as it didn't make any sense. 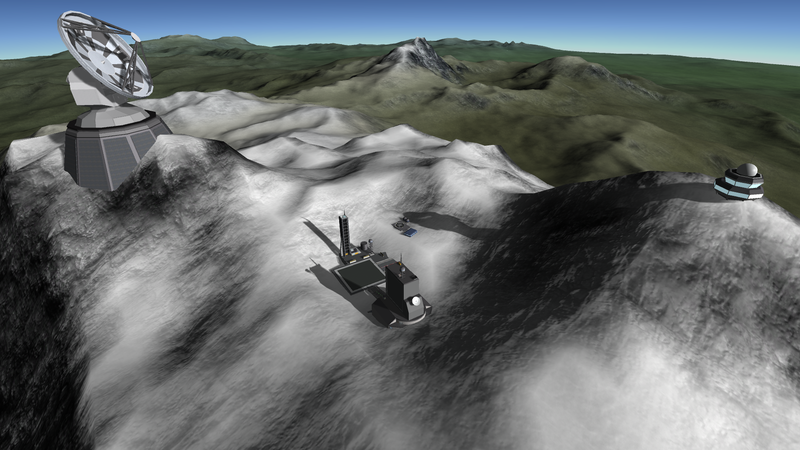 The old recovery could have lead to situations that recovery at a remote base was worse than at the KSC. Also fixed the display of the recovery window. * (experimental )KerbalKonstructs should work better with SigmaDimensions, as now the altitude for most objects is saved in height above terrain. (floating objects at the water surface should stay there. * Objects can be now moved and edited outside the visiblility range of the object. * StaticModules have now an attribute staticInstance which is automaticly updated when the module is attached to an Static Object. * Added AdvanedTexture StaticModule for replacing textures and shaders on a Static. * complete rework of the LaunchSiteManager and the LaunchSiteSelector GUI. It should render faster and has 300 less lines of Code. It is also better to read. * Set the default behavior of the CommNet and RemoteTech support to false. * removed unneccesary the calls to the staticModuleUpdate when a object is selected. * made the the KerbalKonstricts.UI.StaticsEditorGUI.isOpen() function public, so it can be queried from other mods. * Fixed the snap2target and copy/paste position of objects. * removed some orphaned code from the editor. * Fixed the offices and research facilities. 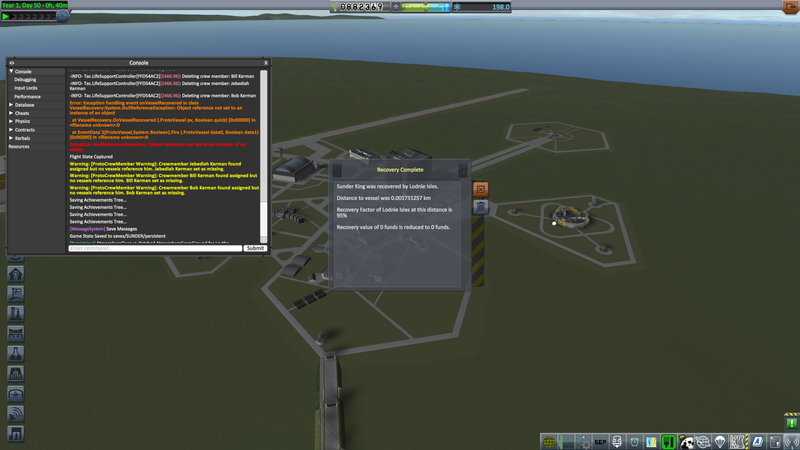 They now prodoce about 5 science and 5000 credits per kerbal and year, so they are now slightly usefull. * New NavUtils Addon by Whale_2: Runways can now create thier own config so they show up in NavUtils. Kerbin-Side will be updated later to make use of it. * The persistence handling changed once again, so all LaunchSites and facilities are closed again, but should now stay open for all players, once they are opened again. please use alt+f12 to refund your closed bases. * Try to implement a bugfix for the loading problem of facility states, that plaques some players. * You can now switch to the old editor camera mode (in the KK settings). Please don't do this while the KK editor window is open. 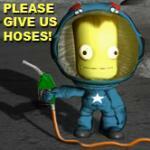 * KK will load and use all shaders, that are in .KSP asset bundles. * BugFix: Setting the group from the statics window will no longer delete all objects in range. * BugFix: Editor: The Snap to Terrain button now does what it should do. * BugFix: GroundStations are displayed on the map on non career games. * BugFix: Removed some errors, when no RemoteTech is installed. * KK now saves everything into the persisence.sfs. This als fixes some load errors, when the SaveFolder is not found. * KK now has per savegame settings. Now CommNet and RT support can be enabled/disabled for different savegames and is not set only once. * the open/close state of facilities is no longer carried over to new games. * Facility Editor: You can no define the default open state of a facility. * Statics no longer need to be in one of the Groups (KSCUprades or KSCRace) to be visible from the SpaceCenter Scene. All Statics and Groups near enought are now seen. * BugFix: Repaired errors in LaunchSiteEditor, when no LaunchSite was previous set. * BugFix: Deleting an static with an LaunchSite removes also the LaunchSite references. * Editor: The "Select an object with the Mouse Key" was changed from "left-shift" to "Tab"
* Editor: The Static List now includes the "number of instances of the same model in the group"
* KK sets the PQS Object name to something parsable. * replaced the Config-Parser. The new one is a bit faster on load. * reworked internal basae classes. This should improve the framerate a bit. * more errors will now show up at compile time and not when running... this should result in less bugs. * created the foundation for more interesting features. * RemoteTech Support: The antennas have the Ranges as displayed on the map. * less memory garbage creation during gameplay. --> better performance. * added dynamic runway markings by whale_2. The model kourseXX will display the corresponding runway number according to its heading. * Added new StaticModule: "FlagDecal" This is basicly the same module as for Parts. It sets a texture of a Model to th actual flag. 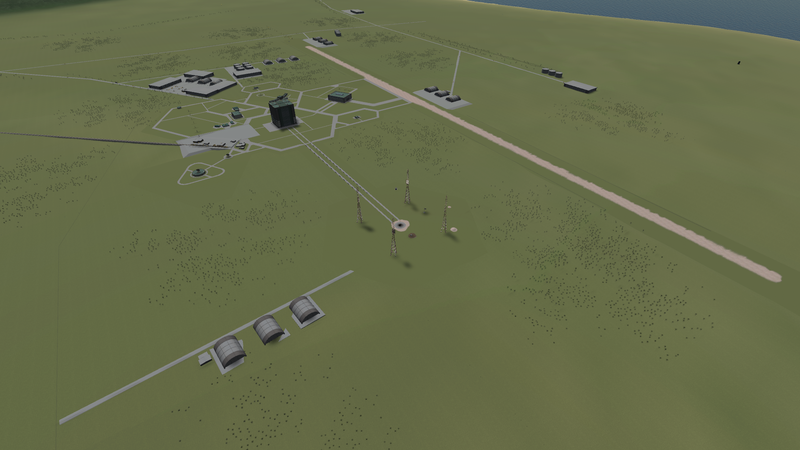 * Added the KSC facility models to the list of placeable models. * When the KK-editor is open, you can select (most) statics under the mousepointer by pressing the "left shift" key. 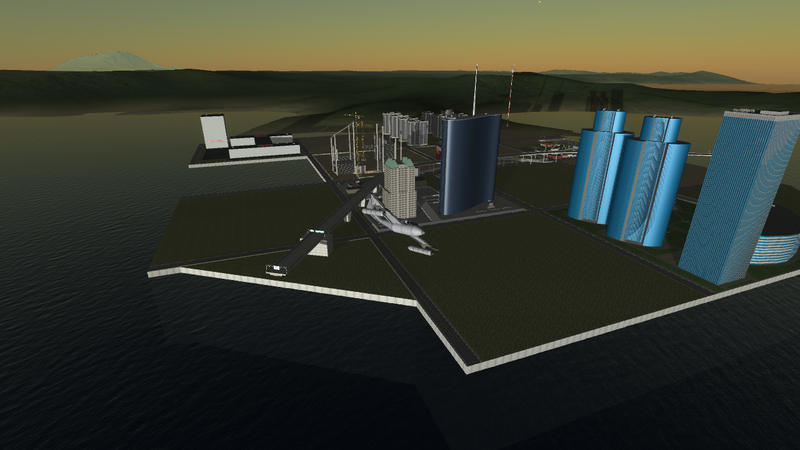 Launchsites: KK will add the KSC to the correct position, if the homeplanet is altered. also KK will not crash when the homeplanet is not named "Kerbin". cfg loader: configfiles for unknown bodies are no longer crashing KK. 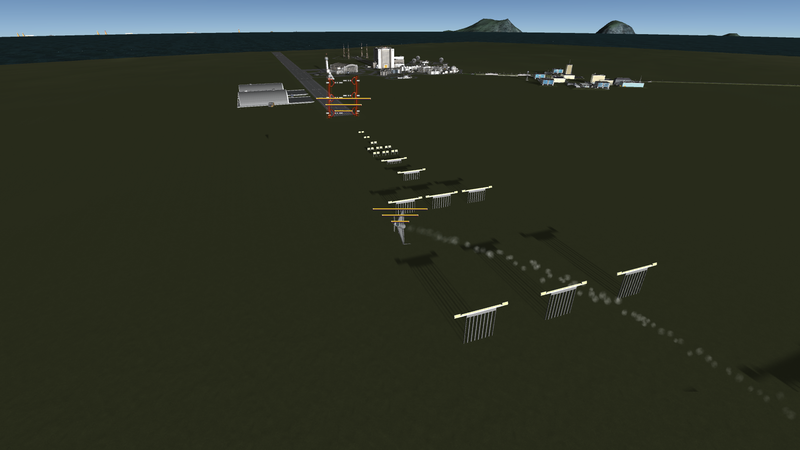 new statics: added runway markings by whale_2. Thank you! editor: used relative directions instead of altering some vectors. all: enabled some more debug output. fixed loading of the kosmodrome mod. added a "set Launchsite" Button to the launchsite selector, because I searched always there for one. Camera is now resetting after a facitity was selected and the window is closed. inflight mapview is now showing icons, even when the Body is not explicit selected. I've got the personal permission from AlphaAsh to distrubute his Art assets. Oh finally I can play again my career with KerbinSide! 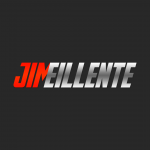 Amazing mod, KSP is not the same without it. Thanks @Ger_space for maintaining this. Hoping to see all the further update. I'm very glad to see this being updated, thank you. Both the link to Kerbin-side and KSC++ link to the thread for Lack's SXT. No, I was just incompetent. It's now corrected. The KSC++ is linked a bit below of the SXT stuff. Yay, I can continue my game! It's Great mod, and excellent work. Ger_space, congrats with release and Thank You. Very Much. @Ger_space, how you've got that '5' on the runway? I never saw runway markings in the old KK nor addons - I actually made my own. If this is not the reinvented wheel, maybe it makes sense to merge them into new KK? I'm also thinking about procedural generation of runway heading markings. That picture is the KSC2 from the Kerbin-Side complete package. I havn't made it so I have no idea how the runway got it's number . 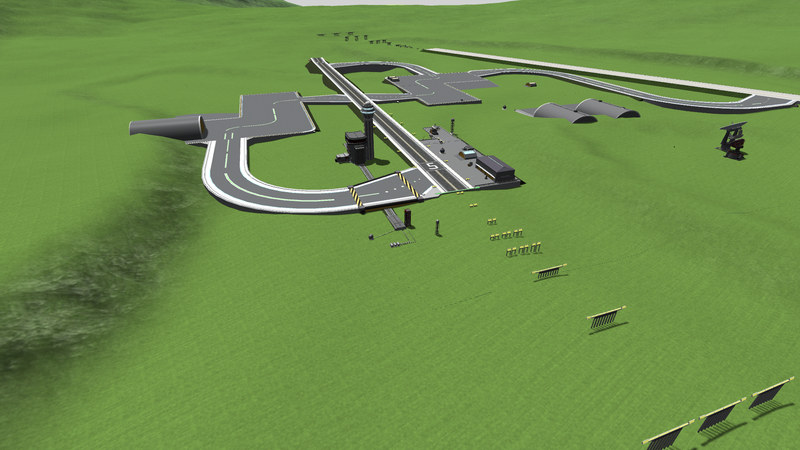 New assets are allwas welcome and I'll add your runway markings to KK. But please give me some time for it. Currently I'm the process of rewriting the mod, mostly seperating game-logic from drawing functions and moving some functions to the classes where they belong. And I'm sure you'll do a great job of carrying on this wonderful mod. Thanks for picking up the baton. Can you add a tutorial on how to add static stuff like runways? It is also a bit obsolete but the general principles remain the same. IMPORTANT NOTE: The Kerbal Konstructs base editor doesn't come with any parts, it's just the functionality. So before you can build your own base, you have to install some existing bases. Then the editor can make copies of buildings in the existing bases for your to arrange in your own new base. Either that or make your own 3D models. I think I found a bug in career mode. Whenever I tried to recover a vessel from any purchased KK facility (in my case i tried with Lodnie Isles and Polar Research Center from the KerbinSide package) the crew are not recovered and the parts refund is 0, not matter the facility has a recovery factor. The worse part is when I tried to launch another mission I noticed that the crew status is missing in action! I have checked and I'm pretty sure it is related to the recovery method used in Kerbal Konstruct. Anyone getting this problem too? I can reproduce the error, so I have logfiles. I'll look into it. It contains the fixes for the missing kerbals and the initial startup is 20% faster. down from 23s to 19s for the Kerbin-Side-complete package. Currently I'm working on further improving the startup time. I found today whats the cause behind the long wait at the game start, so in the next official release the startup should be a lot faster. Wow thanks for this quick fix! Now I could take those KerbinSide contracts I like. I'm so excited to take a look at this pre-release. no more hanging before the MainMenu loads. It might have killed some static assets, but I havn't found any broken. This will be probably the last release which looked like before. small updates to the Editor window, so the incement offset can be selected with the mouse. the launchSiteSelector will have a big "use this site" button. Removal of KerbinNations. They never had a purpose and I have no Idea how to give them one. The tracking stations feature and "Downlink" will die and will be replaced by true ComNet and RemoteTech groundstations. New ConfigFile format for base facilities like fuel tanks and mines. Non-migrated assets will still be visible but have no extra functions. how to download for KerbinSide?